Regular readers and followers of TFSR on Twitter and on Facebook may have noticed that we’re excited about the month of November. 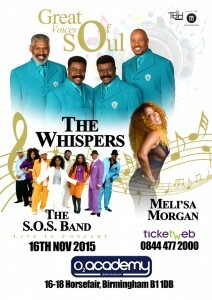 In fact we’re very because this November sees the Great Voices of Soul UK tour hitting London, Manchester and Birmingham for what promises to be three incredible nights of soul music. 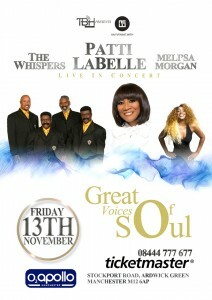 The legendary two-time Grammy Award winner Patti LaBelle will be joined by Meli’sa Morgan and The Whispers at all three dates, with those going to the London date at the SSE Wembley Arena on 15th November will also be treated to the soulful sounds of Soul II Soul, Gwen Dicky of Rose Royce, The SOS Band (who will also be at the Manchester date), and Loose Ends’ Carl McIntosh. We’re delighted to bring you another very special interview here on TFSR in preparation of the headliners on the Great Voices of Soul UK tour. We had a lengthy conversation with founding member of the The Whispers Walter Scott about the group’s fifty-one year career, their biggest hits, their love of music, and what makes The Whispers one of the most special soul groups of all time. You can listen to the full interview below, via our Mixcloud page. The Great Voices of Soul UK Tour starts 13th November at the O2 Academy Birmingham, 15th November at London’s SSE Wembley Arena, and 16th November at Manchester’s O2 Apollo. Tickets are on sale here, and like the tour’s Facebook page for updates. We are also trailing the use of YouTube to host our content, let us know which you prefer!